Second Chances is a great choice for a relaxed getaway. It’s 200 meters from Grace Bay, so you can go to the beach whenever you want, and its pool terrace is extremely private. You can easily keep track of everyone in the open Great Room and go back to your suite to relax in peace. Located in the Sunset Beach gated community, and minutes from Grace Bay Beach! Second Chances is in a gated community called Sunset Beach that’s only 200 meters from Grace Bay. This villa allows guests to choose from a variety of interior and exterior gathering areas. Second Chances’ garden courtyard welcomes guests with a bubbling fountain and al fresco living. The main terrace has everything a traveler could need, from oversized armchairs and daybeds to loungers and a dining table. All of this revolves around the night-lit lap pool, while a Zen statue keeps watch from the palm grove. There’s also a hammock to snooze in and a Weber grill for afternoon barbecues. The Great Room is super open to the main terrace, thanks to sliding glass doors and tons of windows. 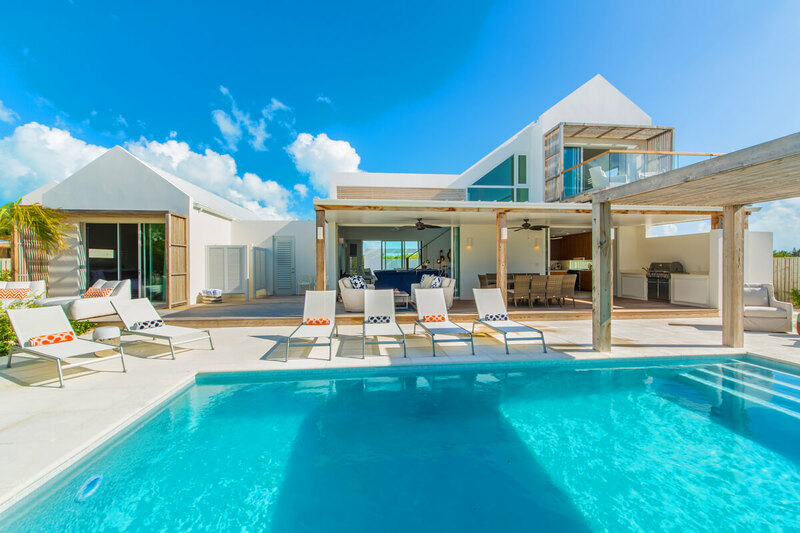 Whitewashed interiors and high ceilings reflect natural light and pops of blue mimic the sea in Grace Bay a few yards away. The Great Room encompasses a living room with a flatscreen TV and plush sectional, a dining table for 8, and a kitchen fully equipped with stainless steel appliances, lots of prep space, and a breakfast bar. There’s also a small library, complimentary WiFi, and a washer and dryer. Each bedroom is designed to be a personal retreat with a flatscreen Smart TV, cozy armchair, safe, and ensuite bathroom. While the Great Room has central A/C, each bedroom has inverter technology A/C. There are five bedrooms total, including a children’s room and four master suites. Two of the master suites have king beds, rain showers, and direct access to the terrace. The two other master suites have king beds and private balconies. The children’s room has two twin beds, a shower/bathtub combo, and interior access only. Second Chances is minutes from Blue Haven Marina, Provo Golf & Tennis Club, and Grace Bay’s restaurants and shops. Guests can walk to the nearest spa and beach, or drive a few miles to Long Bay for kiteboarding and surfing. Upon arrival guests will be met at the airport. After securing their rental car they will be led to the villa for an orientation of the property. If guests prefer, they can pick up the rental car upon arrival and meet a member of the villa management at the villa. AC is included within reasonable usage. Car rental, private chef, butler, server, daily maid service, grocery and beverage shopping (pre-arrival and during your stay), liquor and wine delivery, nanny service, baby equipment, spa services, yoga and personal training, photography, and private airport transfer/car service can be arranged for an additional fee. Excessive AC usage can result in additional fees.